Robin and I will celebrate 20 years of marriage this year, and those of you who know us well understand what I mean when I say I married way over my head. As I was processing many different discussions this past week, I was reminded that a marriage is very similar to long-term investing. What better stock to look at than Amazon when it comes to the long game. As I think about our marriage, I can look back with honesty and say not every year was an “up and to the right” year. As you look at the chart above you can see some red representing down years. You also see some slow and steady growth years, but they were green. As we look at our marriages, just like we look at investments, it is important to look at the long game. Investing for the long-term means that when there is a bad day or week, or a down season or a down year, you don’t sell the stock and enter a new investment. Similar to when marriages fall on harder times or seasons, we don’t cash out looking for quick returns. Processing the long-term perspective, I want to share a critical learning we have discovered along the way. 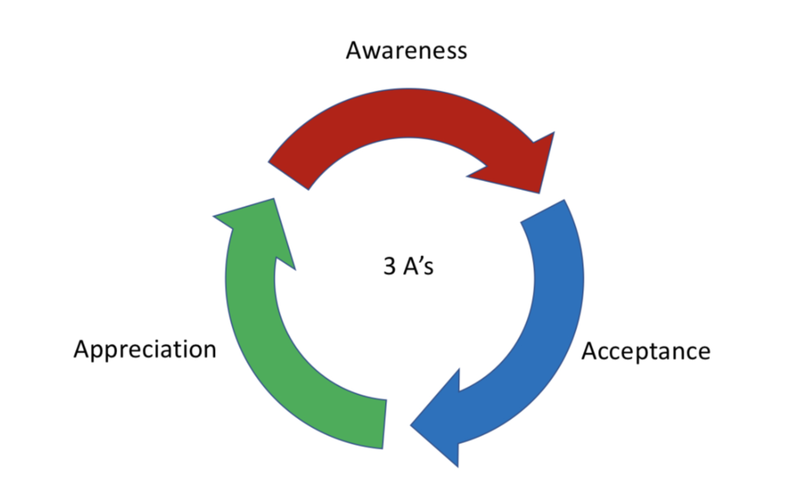 I call it the 3 A’s - 3 phases, or mindsets that every relationship walks through. The first phase any married couple enters is the awareness phase. This is the time when the honeymoon phase ends and you run smack dab into the awareness of each other’s significant differences. This also can, and often will, be the awareness that each other’s expectations are in different universes. I remember a few very specific awareness times early in our marriage. One was so basic, but really was a struggle early for us. Another for us was around finances, and I quickly became aware how different our views on finances were. Awareness sets in and you are faced with a decision. Will this awareness lead to healthy discussion, transparency and conversations? Or, will this awareness lead to silence, frustration and gradual emotional isolation from each other. Awareness is so powerful, and we must lean into it and press hard into phase two. Everything starts with awareness, but it’s really important we don’t get stuck in the awareness phase. As our relationships mature and our marriage grows, we move into the important acceptance phase. This can look different for couples, but the common connection is those differences we become aware of, we start to accept our spouse for who God made them to be. Now, this DOES NOT mean that we throw out excuses of why we can’t get better and grow. Acceptance is not about excuses. Acceptance is about realizing and accepting our spouses for who they are and for who God made them to be. For Robin and I, this was a great phase for our marriage. The early phase of awareness really lead to some frustrations around our differences. However, as we matured and leaned into our relationship and transitioned into acceptance, we could start to see the unique gifts we each brought to the marriage. Robin and I are near opposites, and those difference when looked through a worldly and selfish lens can be frustrating and irritating. However, when we shift our perspective and look at those differences in a selfless lens, we realize those differences are actually strengths. Acceptance is a huge step forward in a healthy marriage. Recognizing our spouse for who God made them to be is a big step, and requires sacrifice. The reality is, we are all selfish...we are humans. For us to really embrace acceptance we must die to our selfish desires and once we do, we then have the ability to start to understand the final phase of appreciation. Finally, after awareness transforms into acceptance, the process moves into appreciation. Honestly speaking, I see so many married couples who never enter into this phase because of so many different reasons. It took years for Robin and me to really figure this out and move fully into appreciating each other for what we bring to our relationship and marriage. Again, this goes back to our natural selfish nature as well as our own self-esteem issues. Your relationship will never be able to enter the appreciation phase if you find yourself competing against each other, threatened by each other, or in anyway jealous of each other’s gifts. I have never experienced and been more challenged by God’s word more than in this area of my life. Reading Jesus’ words that are enforced by Paul over and over about being willing to “die to our self” is the only way to fully enter the appreciation phase. NOTHING about full appreciation is natural or of this world because it goes against everything in our flawed human condition. However, with the power of the Holy Spirit, as well as the right people in our lives shaping and sharpening us, we can enter into this powerful phase of marriage. Appreciation is truly the blessed and best place for our marriage. In closing, let me circle back to the Amazon long game. Do you realize that if you invested $1,000 dollars in Amazon when they went public in 1997 you would have $634,000 today. In hindsight, this is an easy investment, however, there were many times in the last 20+ years where investors got spooked and sold off. Great investors are disciplined and follow their investment strategy. Great marriages are disciplined and also follow a strategy and plan. Let me suggest you dive into understating the 3 A’s - and with the power of the Holy Spirit move to the appreciation phase as quickly as you can. Robin and I don’t have a perfect marriage, and we both fall short on many levels. However, never forget that perfect is the enemy of great, and a great marriage is better than any return you might get on the stock market, even the Crypto market!